…”because it’s Carnival Time”…those few words just got feet moving and lips singing for true Mardi Gras revelers. Although the carnival season officially began on January 6th, this is the biggest Mardi Gras parade weekend. Party time. Some start partying tonight and don’t stop until midnight on Fat Tuesday, Mardi Gras Day. It’s definitely not a Mardi Gras party without King Cake. 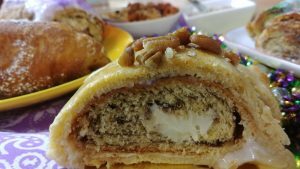 The King’s Cake, Three Kings Cake, or simply king cake is that extra-large cinnamon roll filled with everything from fruit to bacon or kept plain. The fillings may vary, but all King Cakes proudly display the Mardi Gras colors-purple (Justice), green (Faith), and gold (Power). A King Cake party can be like playing the lottery, you never know if you might “win” by getting the baby…talk about excitement in every bite! 1. 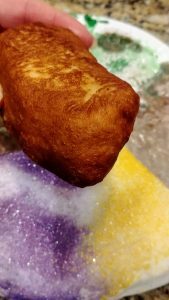 Add filled king cake to food processor. Puree. 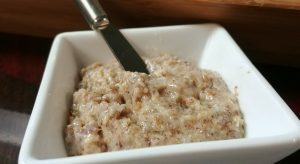 Use as a spread on a bagel or toast or mix into oatmeal. Just have plain king cake? Puree it with cream cheese. 2. Have a plain king cake? Add slices to food processor. Mince. Add some spices like cinnamon, cloves, or nutmeg, if you wish. Put crumbs on cookie sheet. Bake 350* for 5 minutes. Stir. Bake additional 3-5 minutes until crisp and golden. 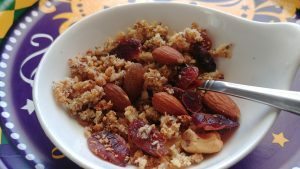 Add mixed nuts and/or dried fruit. Enjoy like granola or mix into yogurt. 3. Dip cut sides of sliced king cake into beaten egg with vanilla, and cinnamon. Cook cut sides on buttered non-stick griddle or pan over medium heat until browned. Works well with both plain or filled king cakes. The icing begins to melt making a syrupy glaze! 4. Yes, it can be fried. Use crescent roll dough. Securely wrap a small slice of king cake. Deep fry until brown. Sprinkle with powdered sugar if desired. 5. Use thin king cake slices to fill a buttered ramekin or small casserole dish. Layer with beaten milk and eggs and bake for a king cake stratta or a bread pudding. 6. 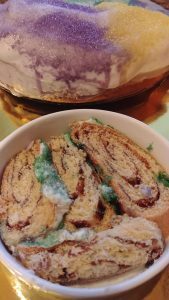 This one definitely brings a stale king cake back to life! If you like a double stuffed pizza this one is for you. Roll out crescent dough. Spread with whipped or softened cream cheese. Cut large slices of king cake. Place king cake onto dough. Wrap securely. Bake 375* 12-15 minutes. I like to brush mine with Irish Cream Liqueur powdered sugar glaze and top with pecans for last 2 minutes. 7. Crumble king cake or use processor to make king cake crumbs. For every cup of crumbs add 1 TBSP (or more) of dark rum. Let sit 10 minutes. 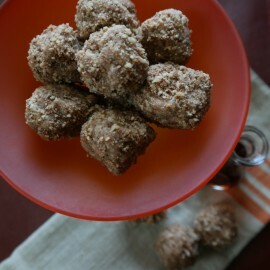 Use a tablespoon to scoop mixture and roll into balls. 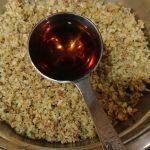 Roll balls into minced pecans, shredded coconut, or color granulated sugar. Cover. Store at room temperature. Gets better with time! 8. Add a slice of king cake, ice cream, and milk to a blender for a king cake milkshake! 9. King cake makes a tasty sandwich. 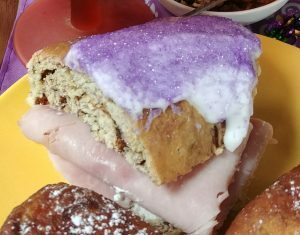 One of my favorites is a ham sandwich on a blueberry filled king cake slice. Try a breakfast king cake egg sandwich, too. 10. 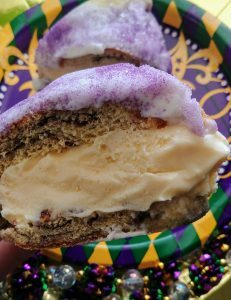 KING CAKE ICE CREAM SANDWICH-Fill slices of king cake with softened ice cream. Wrap in parchment paper. Store in sealed bag. Freeze. Enjoy! One, you can thank me later and two whoever gets rich off this idea, remember me! 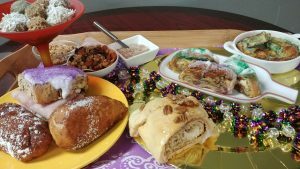 Put your TO COOK IS TO CREATE thinking cap on: Think about how many different variations of king cakes there are and how many different combinations of these treats there could be, especially the ice cream sandwich! 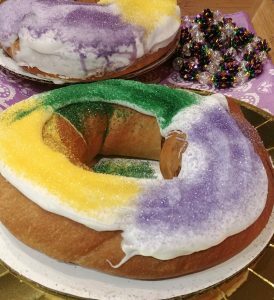 Have a crazy king cake idea? Try it. It just may be the next big taste sensation. 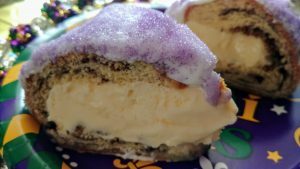 Boudin king cake probably started as a crazy idea, too. Keep in mind king cake freezes well, too! When using king cake, simply keep in mind that it is a large cinnamon roll. Remember all the Uses for Cinnamon Rolls? FOOD FUN: According to the Guinness Book of World Records, did you know the world’s largest king cake weighed over 4,000 lbs and measured 2,643 ft by Haydel’s Bakery in New Orleans. The cake, with 299 lbs of cinnamon sugar and 428 dozen eggs, icing, and the 331 lbs of sprinkles took 3 and a half days to prepare. The bakery actually broke two records that day with two king cakes that circled the Superdome!